City of Lappeenranta  (population 70,000) is the economic and cultural center of southeast Finland situated near the border of Russia and at the southern edge of the Saimaa, the largest lake (system) of Finland. The culture and dialects of Lappeenranta strongly represent Eastern Finland, although it administratively belongs to the Province of Southern Finland. Lappeenranta has a colourful, 360-year history influenced by its location in the border dividing western and eastern cultures. Two highways, 6 and 13 pass through Lappeenranta. Bus companies operate frequently to Helsinki and other cities, even Saint Petersburg in Russia. Highway 13 extends to the Russian border, some 25 km from the city center, where the Nuijamaa border station is the busiest border crossing in Finland. Russian tourists usually use this pathway to come to the city either by bus or a car. The main railway station of Lappeenranta connects the city to the rest of Finland with fairly modern trains, operated by VR . The travel time to Helsinki is currently 2 - 2½ hours (EUR 41.30 as of end-2011). Trains to Saint Petersburg and Moscow stop at a smaller station in Vainikkala, located near the Russian border, about 30 km from the city center. There are connection buses from Lappeenranta City to Vainikkala railway station. Lappeenranta travel centre offers connections to other parts of Finland and to Russia. There are direct connections by bus to Helsinki, Jyväskylä, Kouvola, Joensuu, Kotka, Mikkeli, Porvoo and Imatra. Foreign lines extend to Saint Petersburg and Vyborg. More information about bus connections from Matkahuolto. Low-cost expressbus service from Lappeenranta to Helsinki is provided by Pohjolan Liikenne. The airport is located perfectly only 2 km from the center. It is the oldest in Finland established in 1918. Air Baltic flies to Riga, Ryanair has routes to Weeze near Düsseldorf, Girona near Barcelona and Bergamo. There is a local bus connection number 4 from railway station and center of Lappeenranta to the airport. It serves once an hour. Timetables are available from Lappeenranta city website. 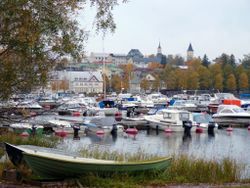 Lappeenranta is a popular destination for boaters within the Saimaa lake area. Some cruise boats operate from Lappeenranta to other destinations within the lake area. Lappeenranta is connected to the Gulf of Finland through the Saimaa canal. Visa free (remember to always check the current situation) cruise boats operate from Lappeenranta to Vyborg, Russia through the canal. The canal is also popular among boaters, and private boats occasionally come from as far as Southern Europe. Everything is within walking distance at the center. Even the airport is within walking range if you do not have much luggage, but taxi or local bus is probably preferable. Getting further to the suburbs is easy by bus. There is a graphical route planner to find timetables. Historical fortress, . Visit the fortress, the original city center which was established in mid-17th century. The old buildings include artist workshops, the oldest orthodox church in Finland, completed in 1785, as well as the Museum of South Carelia  and the Art Museum of South Carelia . Sandcastle, the biggest one in Scandinavia, . Each summer an ever larger sandcastle is built by artists on the northern end of the harbour area. Each year they have a different theme and make sculptures on the walls of the castle accordingly. There is a small theatre inside the castle playing acts intended mainly to children and families. Harbour area. The harbour, the parks nearby, the fortress and Myllysaari beach are a perfect place to chill out in summertime, sitting on the terraces, drinking, eating and watching the boats and things that happen. Live music played on many summer days. Early in August there is a popular festival called "Linnoituksen yö" (Engl. The Night of the Fortress) in the harbour and fortress area. Lake Saimaa and The Saimaa Canal. Take a cruise from Lappeenranta to the Saimaa, Saimaa canal or Vyborg, Russia through the canal! This canal was build to connect the Saimaa to the Baltic Sea at the dawn of industrialisation. The canal was modernized in the 1960s. Finland pays rent for the Russian parts of the canal. The current hire contract expires on 2013, and Finland is currently trying to start negotiating extension to the contract. The canal itself connects to the Bay of Finland, on Russian territory, close to Vyborg (Finn. Viipuri). The canal is mostly used by cargo ships, but there are also passenger boats operating from Lappeenranta to Vyborg. It is also used by private boats from Finland and abroad. In winter, the city seems to quiet down a little. The main attractions during winter are the city theatre and major league ice hockey and basketball games. Also many possibilities exist for practising winter sports. There are tens of kilometres worth of cross-country skiing tracks (a popular stage circles around the airport), and also a small downhill skiing slope. Many outdoor and indoor ice-rinks are available for skating. The city bay becomes a skating track during winter. Lappeenranta is well-known for its large outlet stores that offer significant discounts on fashion clothes, sports apparel and shoes (incl. some good-quality local brands such as Luhta or Rukka), consumer electronics, home and DIY items, car parts and accessories. Most of them are located in the southern part of the town. Small coffee booths at the harbour and the market place (Kauppatori) offer traditional meat pies called vety (Eng. "hydrogen") and atomi (Eng. "atom"). Vety consists of a meat pie, ham, boiled egg and condiments. Atomi has either ham or egg, but not both. Also other snack food is offered by the booths. Many pizzerias, fast food places and ethnic restaurants are available in the city. Wolkoff, Kauppakatu 26, tel. +358 5 4150320. Mon-Fri 11AM-11PM, Sat 4:30PM-11PM, Sundays closed. A nice, cozy 50-seat restaurant in a historical 150-year-old house. Non-smoking. In the summertime, seats also available on the courtyard. Main dishes €14-28. Majurska, Kristiinankatu 1, tel. +358 5 4530554, . A romantic café in the historical old Fortress. Delicious homebaked cakes and tarts. Open M-Sa 10AM–5PM, Su 11AM–5PM, an hour longer in summer. Prinsessa Armaada, harbour, tel. +358 5 4513376, . 10AM-2AM daily in summer (subject to weather). A popular hangout place in the summer, this restaurant is built on an old parked steamboat. Most people come here for drinks, although they also serve food (main dishes €9-17). Another similar boat restaurant, S/S Suvi-Saimaa, is located next to Prinsessa Armaada. An old, classy restaurant, Kasino, has also a separate terrace docked on the water at the harbour. Most of the other popular bars are located in the city centre. Some mid-range and budget hotels are present. Local student housing foundation, LOAS , offers affordable accommodation during the summer months for tourists. Sokos Hotel Lappee, Brahenkatu 1 (next to Galleria shopping mall), tel. +358 (0)10 762 1000, . A comfortable chain hotel in the middle of the city overlooking a square (currently under reconstruction) with the town hall's blocky architecture. Part of the complex that houses the city's shopping center and movie theater. Lappeenranta is a safe city very accustomed to foreigners. It is also the second most popular destination in Finland, mainly due to Russian shopping tourists, but also many other nationalities visit during summer months. This page was last edited on 19 June 2018, at 20:05.